The newly crowned Welsh Champion, Tredegar has just about recovered from its latest high profile performance — this time surrounded by an audience estimated at over 1 million people. The band was invited to take part in the 'Put it to the People' march in central London last weekend, with the players boarding a coach in the early hours of Saturday morning to reach Hyde Park Corner in time to meet the organisers at the front of the event. Just before they had regained the Welsh title in Wrexham the previous Saturday they welcomed a crew to their open rehearsal to record their contribution to a special film released ahead of the march, which has now been viewed over half a million times. A Band spokesperson told 4BR: "We have a proud history of being both a politically and socially engaged organisation throughout our 143 year history — from the visit of the Radical Leader Sir William Harcourt to Tredegar in 1896 to the 1984 Miner's Strike and the more recent 'Pride' celebrations in London and the 70th anniversary of the NHS." 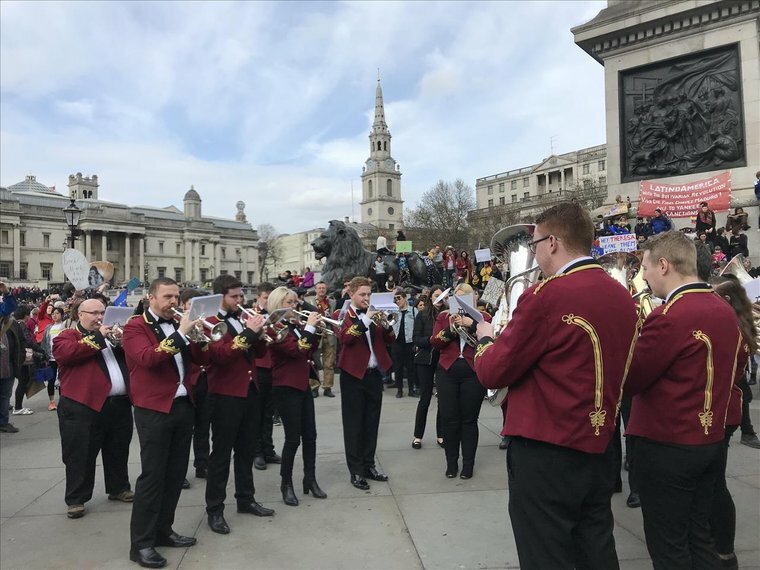 They added: "This was another remarkable event to be part of — and it's not often you get to play an impromptu performance surrounded by thousands under Nelson's Column in Trafalgar Square."